I sit here in utter amazement as I type the first blog entry into the Team Mike’s Bikes site. Only two months ago, I sat down with Matt Adams and Ken Martin, the owners of Mike’s, to discuss putting a team together. In this time, we got 13 riders fully kitted in custom Capo apparel and on bikes from Cannondale ready to race by the first of January. Mike’s Bikes has been an excellent company to work for and fantastic to have as a title sponsor for a team. The company has eight stores in the Bay Area with a ninth opening in Walnut Creek, as well as online distribution. In a time when bike shops are closing their doors, Mike’s has only continued to grow. 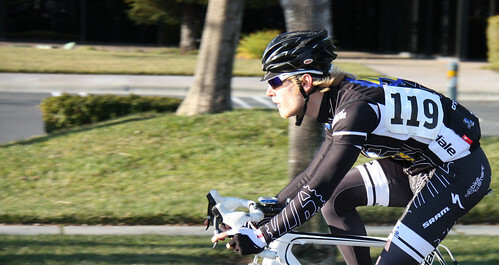 While some of this success might be due to the growing popularity of cycling, I can tell you firsthand that their success is directly attributable to the owners’ management of the company. Mike’s has an extremely high standard of customer service which creates an excellent retail experience. The mission statement is to simply “Get more people on bikes!” This requires not only knowledgeable and friendly employees, but enthusiasm and the same passion for cycling. I will admit, prior to working for Mike’s, I viewed them as a soft bike shop on the edge of the Mill Valley Bike Path where weekend warriors went to pickup a gel and refill their water bottles. 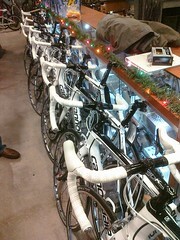 Little did I know that through their doors sat the glorious Cannondale SuperSixes and Specialized S-Works’. Mike’s is even now carrying Wilier and Focus, two foreign-born, high-end bicycle manufacturers, and wheels from Zipp, Reynolds, Mavic, and Shimano to round out the stable. With a full range of men’s and women’s clothing and shoes, professional bike fittings, wheels, parts, accessories, Mike’s pretty much has just about everything cycling related you could need and want. As a team, we hope to unveil this reputation and help Mike’s Bikes push further into the high-end road bike and bike fit market. Our racers share the same enthusiasm for cycling as Mike's through our own means. Whether they’re bringing fresh faces into the sport, providing coaching resources to those who cannot afford it, mentoring new racers, or leading local group rides, this team is an extension of the Mike’s Bikes family. We plan to bring this passion to the race circuit throughout the whole season; look for us in the peloton, at the reg tent, compliment us on our sweet kits, yell “attack!”, or maybe just stop in to your local Mike’s Bikes and say hi.